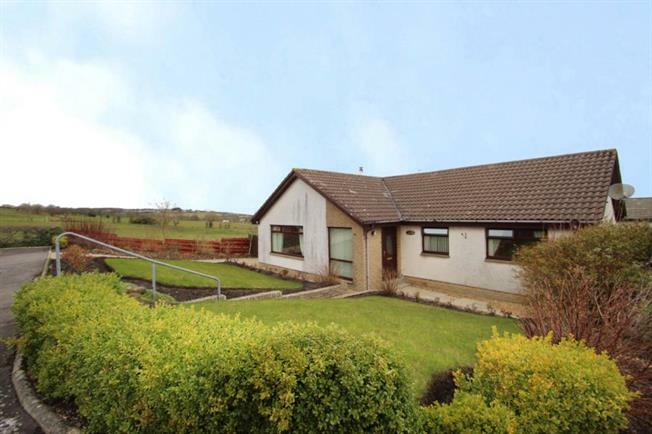 3 Bedroom Detached Bungalow For Sale in Falkirk for Offers Over £200,000. This is a great opportunity to purchase a generous and seldom available detached bungalow, enjoying a preferred cul-de sac location with lovely open outlooks to the side and rear. This charming home sits in a commanding corner position and offers on the level living. The flexible accommodation comprises entrance vestibule, bright reception hallway, sizable dual aspect lounge, three generous double bedrooms, fabulous family kitchen with breakfast bar and a feature solid fuel wood burner. The family area then leads on the rear gardens. A separate utility room is accessed from the kitchen. A three piece family bathroom and a master bedroom with shower room en-suite then completes the accommodation internally. There is good storage located throughout the property, which benefits from having gas central heating and double glazing. Externally, there landscaped grounds to the front that are mainly to lawn with well stocked and planted flower beds. To the side, a monobloc drive provides ample off street parking and leads to the detached garage with power and light internally. The remaining attractive gardens are chipped drying area, rasied vegetable beds and feature timber decking . Early viewing is highly recommended to fully appreciate the level of accommodation on offer and can be arranged through the selling agents. Maddiston offers a fine selection of amenities which will cater for day to day needs including primary schooling and public transport links. There are excellent road links to the M9 motorway with Polmont train station providing rail network to central Scotland.